Our 2014-2015 graduates from the AUC Dual Degree Engineering Program have been a joy to watch as they have achieved their collegiate goals. Next stop: gainful employment! Pictured left to right: Vernon Gentry, Anjolaoluwa Lanre-Ladenegan, Demicca Rice, Nicholas Hines, L. Patrice McGahee, Janetta Brown and Alsidneio Bell. Call it an evening of stars. More than 150 students, parents, corporate sponsors, and program institutions were on hand at the 38th Annual Awards Banquet for the Atlanta University Center Dual Degree Engineering Program, Saturday, April 11, at the Georgia Railroad Freight Depot. Held to recognize outstanding dual-degree engineering students from Clark Atlanta University, Morehouse College and Spelman College. Janetta Brown is a Spelman graduate who is currently attending North Carolina A&T State University. The Most Outstanding AUCC Dual Degree Engineering Student of the Year goes to students who are extraordinary examples while matriculating through the program. This year there were three outstanding students, one from each of the schools: Janetta Brown from Spelman, Vernon Gentry from CAU, and Anjolaoluwa Lanre-Ladenegan from Morehouse. Brown, a mathematics major who graduated from Spelman in 2012, is currently attending North Carolina A&T State University. Academically excelling both at Spelman and North Carolina A&T, she served as a Boeing Co. intern four years and as vice president for the Institute of Industrial Engineers. Vernon Gentry is pictured at his Chevron internship in Midland, Texas. Always a good student, Vernon Gentry, really found his stride while at Georgia Institute of Technology. He is a co-op engineer for Delta Air Lines, an intern for Chevron and IBG Construction Services, and River to Tap Inc. Developing his leadership skills at Morehouse, Anjolaoluwa Lanre-Ladenegan is now president of the Notre Dame chapter of NSBE. A true leader, Anjolaoluwa Lanre-Ladenegan has served as vice president for the AUC chapter of the National Society of Black Engineers and president of the AUC African Student Association. As a Cummins Inc. intern for the past three years, he has excelled, even being featured on the company’s website. Currently in the engineering program at the University of Notre Dame, Anjolaoluwa Lanre-Ladenegan serves as president of the Notre Dame chapter of NSBE. 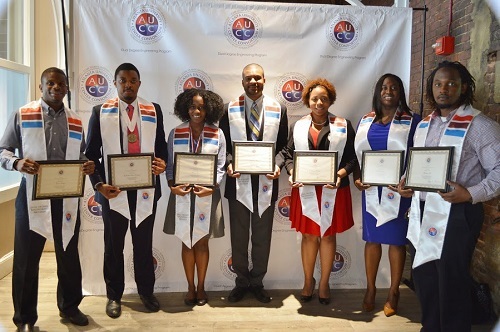 Other AUCC awards included Rakiya Winton, CAU, and Perry Francois-Edwards, Morehouse, receiving the Most Outstanding Engineering Graphics Award. In addition, several corporate and private donors were on hand to present awards. James Honore, CAU, and Jamila Moses, Spelman, were presented with the Colgate-Palmolive Technology for Life Recognition. This award recognizes students who demonstrate academic success and leadership potential. Khreem Coles, Morehouse, and Anthony Body, Morehouse, received the Mary Smalley Cummins Centers of Excellence award, which recognizes academic success, leadership and community involvement. Robert Cummings, Morehouse, and Jamila Moses, Spelman College, were named ExxonMobil Achievement award recipients. Kayla Dean, Spelman, was presented with the ExxonMobil Most Outstanding Second Year Chemical Engineering Student. Perry Francois-Edwards, Morehouse, was presented with the ExxonMobil Most Outstanding Mechanical Engineering Student. Jordan Howie, Morehouse, received the Boeing Company Most Outstanding Aerospace Engineering Student. Jean Yves Ishimwe, Morehouse, was named the Stanford Linear Accelerator Center Most Outstanding Electrical Engineering Student. For CAU students, there is The Terry and Sandra Lee Scholarship recognition, which was presented to Frank Lee. Julian Pilate-Hutcherson, Morehouse, and Mykala Jones, CAU, received the Jackson-Davis Civil Engineering Incentive scholarships. If you are interested in partnering or sponsoring with the Dual Degree Engineering Program to increase minority participation in engineering programs, contact us at 404-523-5148.